Deodar, 42 feet in circumference, near Simla. bl.uk > Online Gallery Home	> Online exhibitions	> Asia, Pacific and Africa Collections	> Deodar, 42 feet in circumference, near Simla. 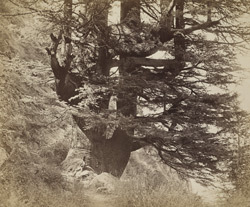 Photograph of Deodar tree near Simla, from the 'Strachey Collection of Indian Views', taken by Samuel Bourne in 1863. Deodar trees are native to the Himalayas and can grow to 200 feet in height. The name is derived from the Sanskrit word ‘devadara’ meaning tree of the gods; the wood was traditionally used to construct temples.